Ever since I saw the trailer for the movie this last spring, I knew it would at least have to set the right mood for the story. Then I heard the song “Photograph” by Ed Sheeran and I was pleased to see that at least they got a few things right. So we started on a good path. That song fits so perfectly to the whole story and its vibe. Louisa Clark has been living all her 20+ years in the little town she was born in, with her parents, sister and grandfather. When the charming coffee shop she has been working at, helping her family financially, closes, she needs to finds a new job ASAP. The only thing she sees fit for her and her only option in that small town is caring for a young man that after a terrible accident has been left a paraplegic with limited to no use of his hands and several connected health issues. She is put in charge of morale, this proving to be a more challenging task than it seems at first. Will Traynor is understandably sad and lacks the will to socialize or involve himself in activities that might benefit his state of mind. He used to be an energetic, adrenaline junkie, adventure seeker type of person and so, the accident put an end to his exciting lifestyle. Will Louisa be able to improve Will’s life and make him enjoy it again? You’ll have to read the book or see the movie to find out. Or you can just google the ending and spoil it for eternity. When I read a book that is about to be put on the big screen, I do get excited to see the result, but I try to keep expectations as low as possible to avoid being disappointed or ruin the experience of the movie as it is. This adaptation, though, hit all the right buttons. Emilia Clarke was very fit for the role of Louisa Clark with her big smile, highly expressive eyes and with hunting eyebrow moves. Jokes aside, she really did a good job portraying lively, childish and kindhearted Louisa. Will Traynor is played by Sam Claflin who manages to embody, quite convincingly, a challenging character that faces the terrible aftermath of an accident and also a controversial decision. 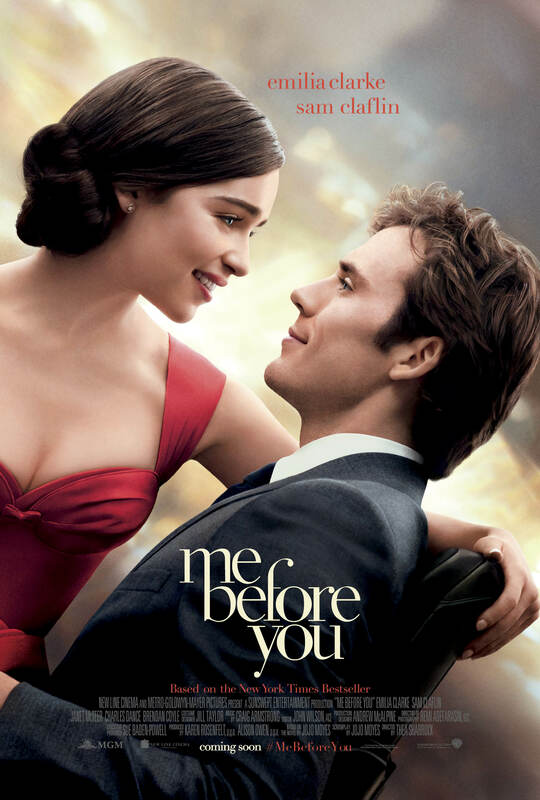 Emilia Clarke, better known as badass, mother of dragons Daenerys Targaryen from Game of Thrones, has good on screen chemistry with Sam Claflin, who we previously saw in Hunger Games, the two sharing their fair share of emotional scenes, their special relationship being managed quite convincingly too. Even though I knew the story and knew what was going to happen, emotions still got to me and crucial scenes got me on the verge of crying. Honestly, I did fight some tears away, I won’t deny that. Every important scene from the book was there, all essential characters were present and also memorable lines from the books got to shine. The soundtrack was spot on, they also got right the feel of the book and even though a certain element of the story was only slightly mentioned and not so much focus was put on it, through all the drama it still kept a light note so you wouldn’t leave the cinema heavy-hearted. Did you see the movie already?